"Because the island was so small, we always met the same people. We even met a few, that we had been eating with us in Singapore about a month ago. 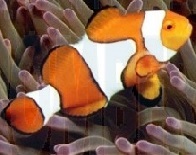 We also went on a great snorkelling tour, looking for sharks, sea turtles and some of the most colourful coral fish. What a paradise! And another day we rented kayaks and left for the northern tip of the island. We made jokes later, because they had not even given us lifejackets. Anyway, we found a beautiful, secluded white sandy beach and decided to park the kayak and enjoy a beach for ourselves. After about 10 minutes this visitor walks out of the jungle. What is going on? He chatted for a while with us and we left for another beach and ended up with a perfect beach. No paths from the jungle, no people, only us. We parked our kayak again and decided to go sunbathing". Perhentian Kecil (Perhentian Small) is the island with the cheaper accommodation. It is said that this is the island for the backpackers, although the prices are changing rapidly. Especially on weekends and holidays it can be busy on both islands, so book in advance or arrive with the first boat and see it quickly and decide. Mosquitoes can be a problem after rain, so bring your own mosquito net if you are staying in low-end (non-air-conditioned) accommodation. There are three camping on kecil: Maya Camping, Rainforest Camping and Pirate's Camping. The first and the last is on Coral Beach; Rainforest Camping is on Long Beach. Coral Beach is significantly quieter in the evening than on Long Beach. On Coral Beach everything is a bit cheaper. In a short time you walk from Coral Beach to Long Beach. Perhentian Kecil is divided into two different beaches, both with their own appearance and personality. Long Beach , on the east side of the island, steals the most attention with its beautiful beaches and a better nightlife. On the other side of the island, Coral Bay - often referred to as Coral Beach - has spectacular sunsets and is clearly more laid-back. A narrow jungle trail, easily reached on foot in about 15 minutes, connects the two beaches. Coral Bay, with its rocky beach and unforgettable sunsets, is much quieter than Long Beach. Fantastic snorkelling can be done on the right side of the pier. It is possible to climb over the rocks to some romantic, secluded stretches of beach. The turquoise water at the Perhentian is warm and full of marine life and white sand beaches. The jungle provides a lush, green backdrop on this paradise island. 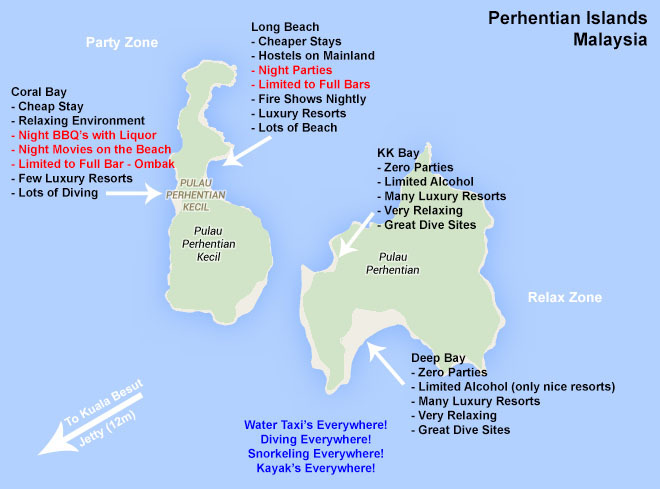 On the Perhentian Kecil you will mainly lie on the beach, snorkelling, diving and kayaking. For trips you are dependent on the legs car or water taxi. Please note that most paths are reasonably passable; signage is not optimal, but everything points its way. If you want to meet the locals, then the Fisherman's Village (south side Kecil) is a nice place. On Kecil, Long Beach to Coral Bay is about ten minutes and a very easy walk. To go from Long Beach to D'Lagoon, follow the jungle path that starts behind Bubu resort on the northern part of Long Beach, when you reach the turbines follow the path down behind the turbines (do not go down the stairs!) a further 30 minutes until you reach D'Lagoon. It takes about 1 hour. If you follow the wide dirt track from behind the turbines you will end up at a beach just south of Adam and Eve Beach. You can walk on the rocks from this beach to get to Adam and Eve Beach and then continue to D'Lagoon on a path that starts near the southern end of the beach. Another route from D'Lagoon is to Adam and Eve beach on the west side of the island (25 minutes), be careful when swimming here as there are sometimes thieves waiting in the forest, though they are only interested in cameras and money. Or another one to Turtle Beach also on the west side (10 minutes). The most popular destination for backpackers is Pasir Panjang or Long Beach on the east coast of Kecil, where a bed in a longhouse, where a bed can be used in a dormitory. More private are the "chalets" with fan, electricity and bathroom. But be prepared, that there is noise at night from the bars on the beach. Most accommodations are quickly refurbished. It is best to snorkel from the beach at Long Beach. But .... if you travel to the island of Kecil, you must have reasonable expectations. This is a small island with hotels, chalets, bars and clubs right on the beach. You will be people during your backpacking trip, so be prepared to share your experience with strangers, which you can or can not handle. Yet ..... this picturesque tourist location Malaysia turns into a party spot as soon as the sun goes down. 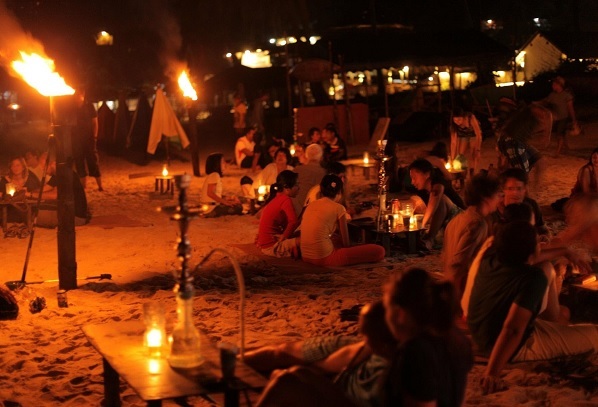 Perhentian Kecil has made a name for itself as a diving center, but its liveliness is clearly visible to the young people, who visit the cozy beach bar in the evening. It is almost as if the night is always young on this island. The island has several bars along the beach. You should check the schedule during your visit when each bar is opened at night. This is a small island with a non-traditional scheme and a way of life. Perhentian Kecil is also home to the annual Perhentian Island Challenge, which attracts a lot of participants and visitors. The most eye-catching bar on the island is Palm Tree. They sell a wide variety of drinks and attract travelers from all over Europe and Asia. The bar is a good place to meet new friends during a drink. Another top bar is Long Beach. The experience is similar to Palm Tree, but with the added value of a campfire on the beach. While the campfire is burning, you can lie on the beach and watch the stars at night. The Lilly Bar, on the other hand, is a small, quiet bar. It is a relaxing place to enjoy a few drinks with your best friends. This is the place to visit, if you want to escape wild parties and just enjoy the warm weather and the nightly beach air. Apart from a few small shops with basic necessities and a few tables with handmade jewelry, there is no shopping on Perhentian Kecil. Electricity on Perhentian Kecil is supplied by a generator, but power outage is common. Some small bungalows only have electricity in the dark. Mosquitoes can be a real problem on the island after a rain shower; bring protection. The sun is stronger than expected on the island, so bring sunburn. 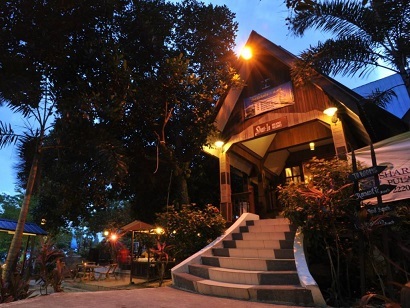 Shari-la Island Resort is ideally situated on Perhentian Kecil; at one of the most popular beaches of the Perhentian. No less exceptional is the hotel's easy access to the islands myriad attractions and landmarks, such as Pulau Perhentian Beach. At Shari-la Island Resort, every effort is made to make guests feel comfortable. To do so, the hotel provides the best in services and amenities. For the comfort and convenience of guests, the hotel offers 24-hour room service, free Wi-Fi in all rooms, 24-hour security, convenience store, daily housekeeping. Guests can choose from 99 rooms, all of which exude an atmosphere of total peace and harmony. Throughout the day you can enjoy the relaxing atmosphere of the watersports equipment rentals, snorkeling, private beach, diving, fishing. Shari-la Island Resort is a smart choice for travelers to Perhentian Island, offering a relaxed and hassle-free stay every time.